I've been busy making some Father's Day cards. This is one I designed for today's class using a stamp set from our last mini called Moon Lake. Unfortunately it didn't carry over, but I thought this image with the boat works so well for a masculine card. Its stamped in Early Espresso ink onto Very Vanilla card. I've also used the Deco Label and Oval framelits here to frame the image and a Base card of Early Espresso card with the Woodgrain textured paper from the Natural Composition designer paper from last year. I've also added some Linen thread and one of the small wood buttons. The greeting is from the Teeny Tiny Sentiments stamp set punched out with the new Washi tape punch. Thanks so much for stopping by. I'm off to Brisbane for the weekend to go to a gig with my sister. The ticket was a birthday gift from her so there will be no posting from me until Monday. I hope you enjoy your weekend too. 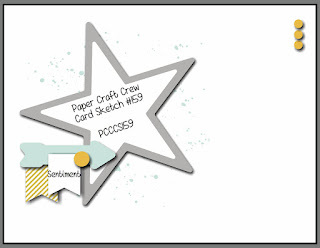 Welcome to our Wednesday card sketch challenge at the Paper Craft Crew. Here is today's sketch for you to play along with. I've made a Baby Boy card with today's sketch and I left off a couple of elements which I didn't think it needed. I've changed the placement of the sentiment, but the essence of the sketch is there. I've used Whisper White card combined with Dazzling Diamonds glimmer paper. Inks are Soft Sky and Lost Lagoon and stamp sets are You've got This, Bright & Beautiful and Celebrate Baby. 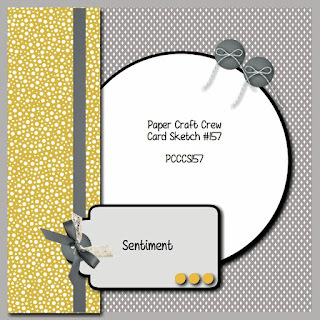 We hope you will join us with a card of your own this week at the Paper Craft Crew challenge. Have a great day. 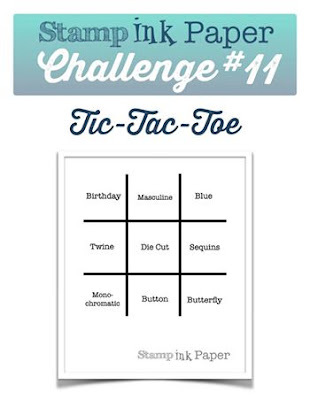 Its Tuesday and that means is time for another challenge at Stamp Ink Paper. This week is Tic-tac-toe and you may choose to use whichever line you like. I've gone with the third vertical line, Blue Sequins Butterfly. What a surprise, lol. This card also qualifies for the Diagonal line Birthday, Die Cut, Butterfly. The cardstock I've chosen is Bermuda Bay, Whisper White, Soft Sky and Night of Navy. The stamps are Gorgeous Grunge, Watercolour Wings and Well Scripted. I added Silver sequins to the background from last year's Christmas pack called Frosted Sequins. Butterflies have been cut using both Butterfly thinlit and Bold Butterfly framelit dies. We hope you will join us this week at Stamp Ink Paper and we can't wait to see what you make. Please visit and see what our other designers have created this week too. Have a great day. It's been another busy weekend and I can't wait for the week to start to get back into a routine. I bet you don't hear of that too often, lol. I like Mondays. It will be an early start thought because my eldest daughter is off to camp. I've needed to get some Father's Day cards because in Australia its only 2 weekends away. I've used the car image from my vintage stamp set called Rev up the Fun. Here's the first one in Basic Black, Whisper White and Lost Lagoon. The patterned paper is from last year's pack called Back to Black. I've used the new Washi punch on the Father's Day greeting which comes from the stamp set Teeny Tiny Sentiments. Here's a closeup of this one. The second card I made in the landscape style with Basic Black, Whisper White and Cherry Cobbler. This one had a bit for detail, including Oval Framelits and some ribbon. Here it is. And here is the closeup. The final pic is both of them side by side. Sorry, I've been missing for a few days. Its always a busy time towards the end of the week with Basketball for my daughter and a number of appointments. Especially busy on the weeks my husband is home and arrives back with all his washing. I've made virtually no time for cardmaking this week, but I did finish off this card I was working on today, doing a little watercolouring on the Hostess stamp set called Best Thoughts. It's a very simple one layer card made from a Whisper White base. This was mainly to try out this stamp set. I've coloured the bloom with Perfect Plum, Lost Lagoon and Old Olive inks and an Aquabrush, stamped the greeting in Memento Black ink and added a bit of Wisteria Wonder ribbon to the stem. Here's the full view of the card. Thanks so much for stopping by today. Have a great weekend. I'm back with the Wednesday challenge at the Paper Craft Crew this week. Here's our sketch courtesy of Pam. We can't wait to see what you create with it. I've decided to make the Timeless Elegance designer papers the focus of my card combined with the Deco Label Framelits for an interesting alternative to the rectangular centre panel. Some Ribbons pearls and butterflies cut with the Beautiful Wings vintage die adorn the card and the sentiment comes from the Teeny Tiny sentiments stamp set cut out with the Bitty Banners framelits. The cardstock used is Basic Black and Very Vanilla. Here is a closeup of the centre panel. 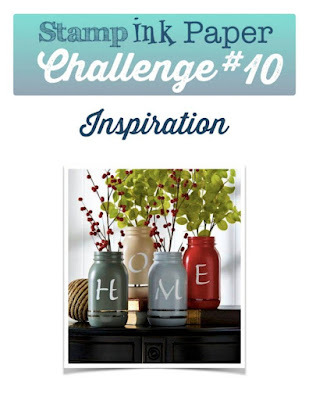 We hope you will play along this week with a card of your own for the Paper Craft Crew challenge. Have a great day. Its time for another challenge at Stamp Ink Paper this week, and here are the details below. You can interpret this challenge however you please taking inspiration from the picture here. I've gone with the colours and the vases and taken the picture quite literally and made an easel card with a shelf on it. The cardstock used is Cherry Cobbler, Crumb Cake and Whisper White. This stamp set I've used is a Hostess set called Floral Wings. I've also used Hardwood background stamp for my shelf and Well Scripted for the greeting. The patterned paper is from the Timeless Elegance designer pack. Below is a side view of my Easel card so you can see how it sits. Sorry I have been missing for a few days. We've had basketball on Friday afternoons which makes it hard for me to get a post done and this weekend has been bedroom renovation time once again. this time it was my youngest daughter's turn. Everything had to come out of her room so it could be cleaned, paint touched up and carpet pulled up in preparation for new carpet being layed tomorrow arvo. It's going to look great, but the real work comes again afterwards to arrange everything again and get the furniture back in. It doesn't do my shoulder much good, but I'm sure it will all look great eventually and be totally worth it. Today's card is one I've finally finished after working on it since last week. I've used the stamp set You've Got This and combined it with the Beautiful Butterfly thinlits largest die and the Lots of Labels framelits. Its a very simple colour scheme. Come and have a look. How's your Thursday going? Its a day I like to spend at home catching up on things, like washing and cooking and just of late Thursdays are a day that my eldest daughter leaves school early for so that she can home study, as do most of the senior students now on Thursdays. We take this opportunity for a short driving lesson, where I let her drive home with her L plates on the car. Yes its nerve wracking, but its also necessary for her to gain some confidence. After that, when I settle down I get stuck into the domestic duties, and if time permits, a bit of crafting before I make the return trip to high school for my youngest daughter. Here's a closeup of the card that I photographed for today's blog post. 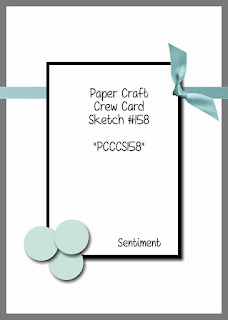 Welcome to the Wednesday card sketch challenge at the Paper Craft Crew. Below is our sketch for this week's challenge and we can't wait to see what you do with it. I've decided to use some vintage stock from my stash and create a Christmas Card. There's some printed Window sheet on my background from the pack called Mosaic Specialty pack from a few years back which I've layered over my base card of Basic Gray. I've stamped my Star from Bright & Beautiful stamp set onto Whisper White card and cut it out with the Star framelits. It's been placed over a Dazzling Diamonds Glimmer card circle and I've trimmed the Edge with the Blackberry bliss patterned paper from the In Colour Paper Stack. Happy Tuesday everyone. Today is our new Stamp Ink Paper challenge which is a great reason to be happy today. This week we have a sketch for you and we can't wait to see what you create with it. My card is below. The cardstock I've used is Early Espresso, Crumb Cake and Very Vanilla. I've combined the Woodpanel Background stamp with Butterfly Basics stamps and coloured the image with Markers, both blendabilities for the pink flowers and Stamp n Write markers for the stems. I wanted my card to look like the flowers were behind the fence and could be seen through the hole. I used the Circle collection framelits to cut the shape from the wood panel. Celebrate comes from the Expressions Natural elements pack. Here's a closer look at that flower. 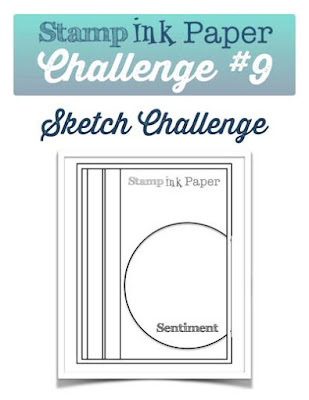 We hope you will join us with one of your creations for our challenge at Stamp Ink Paper this week. Drop over and see what our other designers have made to inspire you and have a great day. Today I'm sharing the birthday card I made for my Brother in law's 40th Birthday party that we just attended. He is a huge fan of vinyl and has quite a collection. I thought this style of card would work out perfectly. Here is the full view of it. The Wish Big stamp comes from a vintage set called Word Play. I dug it out from my box of retired stamps for sale especially. The cardstock I chose was Island Indigo, Very Vanilla and Basic Black which I combined with some of the Music paper that I still have a little of from my retired stash. This photo below shows the inside/flip side of the card. And I have a closer look at the greeting which I used the vintage stamp set Memorable Moments to create. This photo shows the back of the card. His Birthday party turned out to be a great night and quite an event as they joined some celebrations for my 50th as well. Surprise, Lol and kept me up till 2.40am (well past my bedtime).